Martha + Jaime = this week’s dessert! An unlikely duo – not really. I think the emphasis on simplicity and flavour in some of their recipes work well together. The dessert that I made for this Friday night dinner was a vanilla bean angel food cake, oven roasted strawberries, lemon, lime and peppermint sorbet, and whip cream and lemon sauce. It turned out to be a light, fresh, and tasty dessert. Angel food cake is a lovely light and white cake with a tender crumb. It’s distinguished by its lack of egg yolks, chemical leaveners and fat. In my cake, I added vanilla bean to heighten and highlight the flavour of vanilla. Roasting strawberries, which is incredibly simple, increases their flavour, and I think they would also be fantastic with yogurt, ice cream or even on their own. The sorbet is simple, light, tangy and refreshing. I enjoy the look and taste of the tiny bits of zest and mint in the sorbet, but if your not sure, just sieve out the zest and mint, and you will still have a wonderful sorbet. 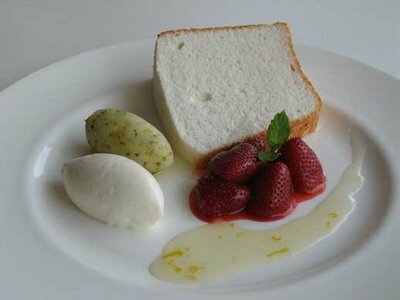 The angel food cake compliments the roasted strawberries, sorbet and lemon sauce; it also acted as a sponge soaking in the wonderful flavours. Deceptively simple and quick, this dessert will have your guests thinking you slaved away! 1 1/4 cups sifted flour (not self-rising) – I used Swans Down extra fine cake flour; sifted flour means sift the flour first before measuring! Preheat the oven to 350ºF. with a rack in the lower third. Cut parchment to fit the bottom of the tube pan. Fit the paper into the pan. Do not grease the pan. Sift the flour, 1/2 cup sugar, and the salt together. Sift again into a bowl. (You should have sifted the flour 3 times by now; this is necessary, as you want to incorporate as much air as you can.) In a small bowl, add the remaining sugar and the seeds of one vanilla bean. Mix and set aside. In the bowl of an electric mixer fitted with the whisk attachment, beat the egg whites on medium speed until foamy. Beat in the cream of tartar and vanilla extract. Raise speed to medium high; beat until the whites are nearly stiff. Reduce speed to medium low; beat in the reserved vanilla sugar, 2 tablespoons at a time. Beat until the peaks are almost stiff but not all dry. Transfer the egg whites to a large bowl. Sift the flour mixture over the egg whites; fold in gently with a large rubber spatula. Gently transfer the batter into the tube pan. Bake until the top of the cake is lightly golden and the cake springs back when pressed lightly, 35 – 45 minutes. Invert the pan onto its legs or hang it over the neck of a bottle or funnel; let it stand, in the pan, until completely cool, about 1 hour. Run a knife around the edges to loosen the sides. Unmold cake, and remove parchment paper. Preheat the oven to 450ºF. Using a piece of parchment paper, coat the bottom of a casserole dish with butter. De-stem strawberries and place strawberries in the casserole dish cut side down. Sprinkle the strawberries with sugar and place into oven. Roast until strawberries start to “slump” and feel soft when squeezed, 10 – 20 minutes. After the strawberries are cool, transfer into a container or use immediately. *both recipes have been adapted from Martha Stewart. Place the sugar and water in a pan, bring to a boil and simmer for 5 minute. Remove from the heat and allow to cool for a while. Zest and squeeze your limes and lemons. Chop the peppermint and the lemon and lime zests, the finer the chop the better. Mix everything together, cover and refrigerate until cold or overnight. Stir sorbet mixture and freeze in your ice cream machine according to the manufacturer’s instructions. This sorbet should be eaten as soon a possible, or within a couple of days, as it will likely get icy, although you shouldn’t have a problem finishing it off. I have made this sorbet many times, and I haven’t tampered with the recipe because it is simple and good. If you want the sorbet to last longer, you will need to add an invert sugar like glucose or trimoline and reduce the amount of sugar. You can also add an alcohol like gin or vodka (use approximately 5% alcohol in the total amount of liquid) to reduce the iciness of sorbet and to keep it for a longer period. Posted by Sam at 4:33 a.m. I particularly love the quenelles (quennelles???). While I am a huge fan of chocolate, I'm also a huge fan of the vanilla bean. I will definitely be trying this. I'm glad that you will be trying it, all my guests seemed to like it. I'm actually practicing my quenelles at the moment. Thanks!